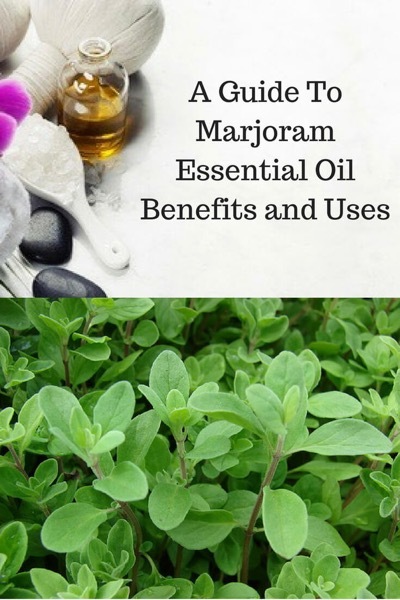 Marjoram essential oil comes in several varieties. Probably the most common one used in aromatherapy is sweet marjoram (Origanum majorana). If an aromatherapy recipe simply lists marjoram as an ingredient, assume it's Origanum majorana. "Marjoram calms the senses and allows peacefulness to come into a frantic world," writes aromatherapist Valerie Ann Worwood in Aromatherapy For the Soul. She states the emotional benefits of the essential oil are to encourage calm, balance, integrity, perseverance, and sincerity. Production: Steam distilled from flowering tops, leaves, and stems of the plant. Is marjoram safe to use during pregnancy? No, according to Aromatherapy and Massage For Mother and Baby. Is marjoram essential oil safe for children? Do not use on babies. Cautions: Do not confuse sweet marjoram (Origanum majorana) with Spanish marjoram (Thymus mastichina), which is a stronger oil from a different plant family. Aromatherapy: A Complete Guide to the Healing Art: Marjoram eases muscle spasms, stiff joints, menstrual cramps, excessive coughing, headaches, and migraines. The oil may slightly lower blood pressure and help relieve colds and flu. The scent helps people who feel emotionally unstable or have a tendency to experience irritability, depression, shock, or hysteria, especially as a result of an external stimulus. The essential oil can help ease insomnia, grief, loneliness, and rejection. Aromatherapy for Dummies: Testing shows marjoram is one of the most effective scents to relax brain waves. Aromatherapy For Healing the Spirit: In Traditional Chinese Medicine marjoram tonifies and circulates Qi-energy, clears cold phlegm, and calms the mind. The oil soothes the flow of Qi-energy in the chest and also restores the Qi-energy of the Spleen-pancreas while calming the nerves. It is a balancing oil that "helps calm obsessive thinking, ease emotional carving, and promote the capacity for inner self-nurturing." The Complete Book of Essential Oils and Aromatherapy: Marjoram helps relieve muscle spasm and pain, general aches, numbness, stiffness, menstrual problems, bruises, headache, indigestion, constipation, insomnia, stress-related conditions, and anxiety. Illustrated Encyclopedia of Essential Oils: Marjoram helps relieve arthritis, muscle aches and stiffness, strains, sprains, coughs, constipation, flatulence, lack of periods, painful periods, colds, headaches and migraines, high blood pressure, insomnia, nervous tension, and stress-related conditions. Aromatherapy Bible: "Marjoram is the great comforter of essential oils and helps with pain on all levels." To make a basic massage oil with marjoram, add 3 to 8 drops of the essential oil to one tablespoon carrier oil. For best results blend the essential oils and let sit for 8+ hours. The add some of the blend to your favorite massage carrier oil (at the rate of about 3 to 6 drops for each tablespoon of carrier oil). Use 4 to 5 drops of the blend in one teaspoon of carrier oil. Massage into back muscles. Add the following ingredients to a one-ounce (30-ml) bottle. Shake. Apply a little of the oil gently over the bruise several times a day. Use this sleep-promoting lotion before going to bed. Option 1: Add the essential oils to one tablespoon of cream or honey. Stir into your bath water. Option 2: Combine 1/2 cup Epsom salt and 1/2 cup baking soda and add the essential oils. Stir into the bath water. Make a hot compress to relax sore, tense, or cramped muscles or to relieve constipation and congestion. Add 4 drops each of marjoram and lavender to a teaspoon of cream or honey. Stir the mixture into a small stainless steel bowl of hot water. Wearing protective gloves, use a wash cloth to absorb the hot water mixture, wringing out excess water. Apply the compress to area of discomfort. As desired, repeat this process when the compress cools. 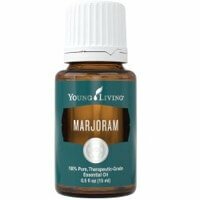 I recommend marjoram essential oil from Young Living.